And every once in a while, people would wander to that entry and ask if I’d heard differently, and what progress I made, and the answer was always “none”. Until recently. So here’s an update on that situation. There are currently three “solutions” in various states of completion, two of which are commercially available and one of which is supposedly just on the cusp of it. So let’s get all that google juice going and say you might be able to read your 5 1/4″ or 5.25″ floppies via usb connection now or very soon. Here are the three solutions floating out there. Now, here’s the thing about the Catweasels: they seem to be a bit of a white elephant. They were designed primarily for the Amiga set, with what can only be called a token appearance in other platforms. reading up on the “manual” for this thing fills the heart with concern. While it is theoretically possible this card will read a whole host of formats, it seems to be difficult to make it do so without a considerable amount of hacking. Witness, for example, this thread in which people hardly rain down ringing endorsements for this product. In this thread, you can see people somewhat happy with it but still finding it fiddly. It may be me being silly, but the whole thing seems kind of “off”, like you’re making this thing do something it isn’t quite ready to do. It lacks, in other words, that sense of drive and commitment. I’m sure someone worked hard somewhere, but it all just doesn’t do it for me. But maybe it’ll do something for you. The second is the absolutely-horribly-named FC5025 Floppy Controller. I realize that you could decode “5.25 Floppy Controller” from FC5025 but you have to admit “Catweasel” is more likely to be remembered. 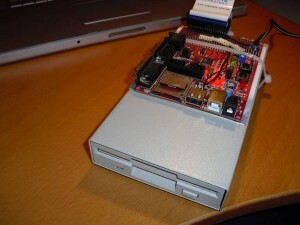 You connect it inside your computer, and hook it both to a USB port and to a 5.25″ drive. After doing so, you use the included software to read between the various formats of various floppies. I should remark that all three of these solutions don’t just allow the reading of IBM/DOS 5.25 disks, but a wide variety. 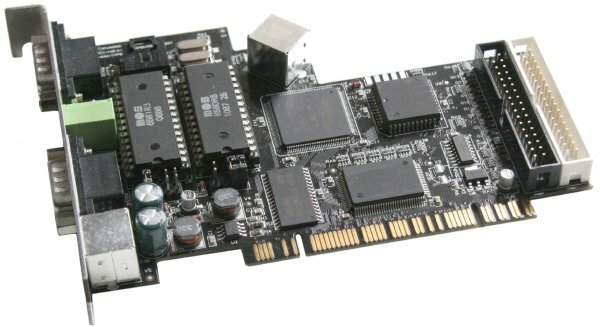 The FC5205, for example, claims you can read: Apple DOS 3.2 (13-sector), Apple DOS 3.3 (16-sector), Apple ProDOS, Atari 810, Commodore 1541, MS-DOS, North Star MDS-A-D, and TI-99/4A. Impressive if true! It’s convenient to shove any old floppy into the same drive and just yank the data off it. I paid money, the product was announced as shipped to me. I will review it once I get it. The third solution looks very promising, but is not official yet. It’s called the Kyroflux, and is part of a larger software preservation effort. It looks to be extremely flexible and open, with a spirit not unlike the Makerbot: a parallel commercial and open effort to ensure that you can acquire what you want in the way you want. The Software Preservation Society has written a lot about their project, so you can browse the site and read up if you want. They promise a lot and they include everything from the software/drivers they’ve written to Eagle layouts for you to make circuit boards. So it’s encouraging, but I can’t actually buy anything and plug it in yet. If I had to guess (and it is a WILD-ASSED GUESS based on watching this sort of thing) you won’t see anything from them that you can just charge to paypal and wait for your box until summer. They may prove me wrong and I am all for being proved wrong if they come out with stuff sooner. If I get a version of it, I will also review it. 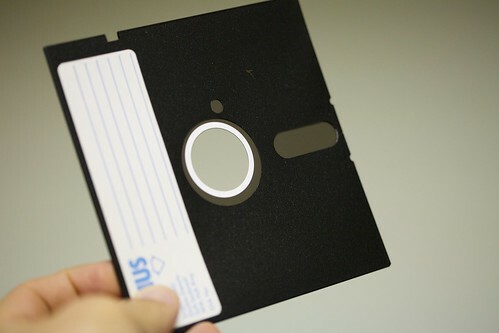 So it looks like 2010 was finally the year for 5.25″ floppies to rise from their graves. However, it may be too late for a good percentage of them. I’ll work like damn to ensure every single floppy of the thousands in my collections are transferred off this year, if this all works. It’ll be a start. By the way, a little extra about the weird way I’m treating hackerish projects in this context, because I forsee a little bit of pushback about this. The people who would be using this item are not people who would be wanting to play the old games and use the old software on old computers. Those folks would either read using original floppies on original floppy drives or, more likely, play using emulators. The people most likely to use these products would be preservationists, both pro and amateur. You have data, it’s on a dying and unwanted medium, and you want it on a new medium, one which is relatively safer. What you don’t want to do is be stuck hoping all the stars aligned with your assembly of your hacked-together project, or that all the drivers are working right, or any of a number of unknowns, because you’re already concerned your floppies are near death and that there might be some strangeness with the format, or a whole range of factors that would prevent the floppy being read under any circumstances. Creating hacked-together might-work projects based on parts adds a flood of unknown variables. Preservationists do not want or need that. I think whoever consistently provides a product that will “do the right thing” so preservationists can get the job done of rescuing data are the ones who will “win”. I’ll let you know who “won”. BTW this reminds me I’ve got some 5,25″ floppies (and a 286 in my parent’s garage) to dump too…. What’s next needed is a robotic device that will automatically feed a stack of floppies into the drives one after another on cue. I’m seeing a Lego driven prototype…. hrmm..
My mother passed away last summer, and this caused my sister and I to finally clear out all the garbage we’d left in the house when we moved out. Along with several boxes of classic PC games, I found several boxes of 5.25″ floppies, mostly old boot and utility disks. Mixed in with them, I found the disks containing the only known copy of a terrible game I wrote in BASIC. At the time, I had no internet access, and couldn’t remember the last time I’d encountered a functional disk drive. With a seemingly insurmountable pile of old belongings and paperwork to sort, prepare for sale, shred or destroy, I made the quick decision to toss them all out. Only now that I’ve read this post am I realizing what I’ve done. KryoFlux was primarily designed for preservation as you say. This means it might be a little different to other products. 1) The software has to be ultra-reliable, we cannot take chances with data so old and fragile. We have spent a very long time testing KryoFlux to ensure that this is the case. Hopefully problems with our software will be extremely rare. 2) We take a “raw read” of the data as it is stored (flux transitions). This means we can read any floppy disk (assuming you can connect the drive), no matter what system it is for, or what copy protection it may contain. We want the original data as it is stored, nothing less with do :). We support output of common sector formats because we think people might be interested in that, but the main “suitable for preservation” output is to be an open format called DRAFT. 3) Related to point (2), we have spent nearly 10 years creating technology to verify disk data (no errors) and ensure authenticity (that it is not a copy or modified after mastering by save games, viruses etc). To do this, we need the raw flux transitions to “see” these things. 5) You are exactly right that you can currently use it only with development boards (which are pretty cheap, at around 55 EUR) or by building our hardware design yourself. Our own hardware design is a prototype, but we are working with hardware manufacturers on the details at the momemnt. Since our hardware is open, it means anyone can make it – they just need a license if they sell it under the KryoFlux name, and those license fees are there to help us with our preservation efforts. If anyone has any questions, feel free to contact us at softpres.org/contact. It should be noted that the two newer devices (numbers 2 and 3 on your list) do not appear to support writing to 5 1/4 floppies, only reading from them. For most people (anyone trying to rescue data off of old 5 1/4 floppies), these devices should suffice. However, the Catweasel also works the other direction. With it, you can download Amiga disk images (in ADF format, for example) and then write them back out to real Amiga floppy disk for use on a real Amiga. There are ways to do this with Commodore 64 and Apple II and other old systems as well, but there has never been an “all-in-one” solution yet. I used a 386 desktop equipped with a 5.25″ drive and LAN manager to preserve my media and transfer it to something more… current. Rob, again, the problem with the Catweasel is that it THEORETICALLY does this via a bunch of complicated maneuvers that range based on which platform you’re using. And beyond that, you need to show me how many people are truly, actually trying to create new disks for these platforms. I think it’s a minority, and the Catweasel doesn’t even serve the majority. I’ve got C=64 files on 5.25″s that, while stored reasonably well, still haven’t seen the light of day in over twenty years. What’s the word on how long the data remains viable on floppies that are this old? With older floppies, it’s a matter of some luck and opportunity, but the situation is not lost. It’s worth at least trying to pull the data down. A lot of factors, including how they were stored, the quality of the original medium, and so on all play into it. I accept boxes of floppies from people if you want me to transfer them. I was wondering about this a while back. I either missed or forgot your earlier entry and am as surprised as you were back then that this doesn’t already exist. I’ve got diskette holders full of 5.25″ disks for both Apple II and MS-DOS that need archiving. I look forward to your future reports. Thanks. @Chris: I recently picked up several boxes of C64 floppies that had been stored in a non-temperature controlled garage for at probably a decade. I then moved them from there to my own non-temperature controlled garage, where they’ve been sitting for at least two years. I pulled them out last week and I had a 95% success rate while reading them. In my experience, heat hurts ’em more than the cold. I have great success with old floppies stored in garages, and not so good with ones that have been stored in attics. @Jason: I know half a dozen or so people who regularly make “real” floppies from virtual disk images. I do this a lot for friends just getting into the “retrocomputing scene”. Before the 1541 Ultimate, the easiest way to do this on a C64 involved using a 486, a special (x1541) cable connected to a real 1541, and special software. That’s a lot of old hardware to be relying on. A friend of mine who offers the same service for old Apple II floppies uses a IIgs with an added 5 1/4 floppy drive and a network connection. For starters I’ll take read-only, but a true panacea device would be able to both read AND write all major retro drive formats. I love 5.25″ floppies. They’re the vinyls of computing, so to speak. I have a question for those who are more expert than me in hardware hacking. When I relocated, I couldn’t bring every computer and peripherals I had accumulated. So I decided to save what I considered the most important things: hard drives and a very reliable 5.25″ floppy drive from my old IBM-compatible PC (a 386DX at 40MHz). The idea was to look for an inexpensive PC box old enough to support these pieces of hardware from the 1992-1993 era. Jason, I’m glad to see you back here! Update. Installing my old 5.25″ drive was easier than I thought. Here’s a short write-up. I stumbled on this thread in search of a solution to recover data from old 5.25 floppies. From Micro Center I purchased an enclosure that is advertized for 5.25 and older CD drivers. It has a disc controller internal and a USB external connection. The only problem is the internal ribbon cable is 40 pin and my 5.25 drive (yes I still had one) has a 34 pin edge connection. I salvaged a 34 pin ribbon cable from an old case used to build a system in ’97. Now I trying to find a solution that will convert from the 34-pin to 40-pin format. Options seem to be along the “gender bender” route: from 34-pin male card edge to 40-pin female or 34-pin female output to 40-pin female output. Haven’t had much luck in searches yet, though did stumble across this site in the process. I find this article very interesting. I think it’s very admirable that people are finally getting around to making devices to enable this. As for the longevity of the media, it seems like 5.25″ disks are more durable than their 3.5″ brethren. This is based on anecdotal evidence, so maybe it’s wrong, but I’ve found far more cases of people saying that they’re surprised their 5.25″ disks still work and others having issues with 3.5″ disks that are only a few years old. The first thing I wonder is why there isn’t simply an adapter to connect a 5.25″ floppy drive cable to a 3.5″ motherboard floppy connector. I’d think (though perhaps I’d be wrong) that would be pretty straightforward and involve the least complicated amount of hardware trickery. Nearly every motherboard still has one of those. I think where these solutions fail is that there is no solution for modern Windows based PCs simply for reading and writing DOS/Windows 5.25″ disks only. I’ve found that any time I ask someone who has the knowledge why this can’t be done, they simply state that the solution is to salvage an old computer, install an ethernet card into it, and transfer your stuff that way. This is a solution for a geek, not the general public. Of course, some nerds can’t think outside of their own world and therefore won’t entertain the idea that other solutions are better. 5.25″ disks have many different formats and those multiple formats usually can’t be both read and written to on the same drive without some form of chicanery. The solution is straightforward with a lot of old computers. There are many cables and adapters that provide solutions for hooking either your drive or your whole computer up to the system. Even these have their downfalls. While often only requiring in theory your own computer, a cable, and the right floppy drive, these cables often use antiquated interfaces. I have an xa1541 cable that I use to hook up a Commodore 1541 up to my PC. The software itself is pretty easy to set up and use. I think even my mom could do it after showing her how to do it a few times. The problem is that it uses a parallel cable to hook up to the computer and that the parallel cable must be integrated onto the motherboard in order to work (except in Linux.) Most new motherboards don’t include a parallel port by default and only include header pins on the motherboard. 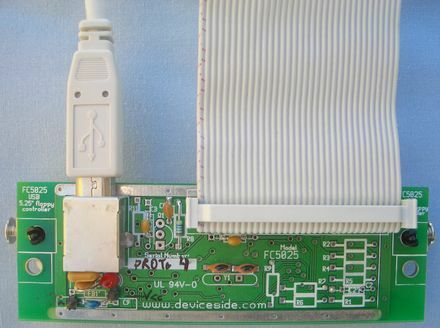 You have to connect a port directly onto the header pins and have an integrated parallel port that way, but most people don’t even know those pins exist or how to install one. USB cable equivalents occasionally exist but they aren’t as evolved and therefore aren’t nearly as capable as their parallel brethren. It’s sort of funny that I have no problem hooking up a Commodore 1541 floppy drive to my PC and both reading AND writing my Commodore data as easy as pie yet if I want to read or write an MS-DOS 5.25″ disk on Windows I’m basically screwed. Anyway, I just discovered this article and I wanted to say thank you, both for this article and your other work. I’ve been a fan of a lot of your work for a while and I just found out that you were behind it. I’m looking forward to seeing Get Lamp. I’ll hopefully be getting a copy in the next few weeks. I looked everywhere on YouTube to try and find the trailor from Kyroflux, since your link isn’t working. Believe it or not, I have about 3 cases of 5.25 floppies that are full of games and I would love to be able to recover them. A rise from the floppy grave, that is something I would never have thought but then again, there is a reason I saved my floppies.